Family members have carried babies in a variety of carriers since the beginning of human civilization. Baby carriers keep the baby close and provide the infant with comfort and security while allowing the carrier some freedom to work and care for other members of the family. The most basic form of baby carrier is the sling. In South America, woven shawls are used to carry babies in front of their mothers. The shawl is anchored over one shoulder, wrapped under the other arm, and tied around the back. The baby is free to nurse and sleep, and is cooled or warmed by the weave and wool of the shawl. In Asia, the sling is tied over one arm but carried lower on the opposite side so the baby rests on the hip. African cultures use the sling in this fashion or with the sling tied in front around the chest with the baby balanced behind. The front-tied sling is also practical for older babies who need to nurse less often and are more settled in their routine. Other Asian cultures tie a woven cloth around the infant in a complex series of wraps and ties that isolate the child's legs on the mother's sides and allow the baby to move its arms freely against the mother. In cold climates where mothers wear hooded coats or parkas, the hood doubles as a sling that gives the baby room to see around its mother's head or cuddle deep in the hood to nap. Hot climates feature baby carriers of loosely woven airy cloth and even net bags that can be hung from the shoulders or balanced on the head. The cradle boards used by many tribes of Native Americans are ancient forerunners of today's framed back-pack that provides rigid strength to carry the child and cloth wrapping for comfort. Side-and hip-balanced carriers are used by fathers and brothers who hunt and harvest with the baby. Other relatives can baby-sit, thanks to the convenience of baby carriers. The closeness of the baby carrier is not only a convenience but a way of nurturing the whole family. The invention of the cloth infant carrier grew out of one woman's service in the Peace Corps. Ann Moore, a pediatric nurse who worked in Togo, Africa, in the 1960s observed the native women carrying their babies in slings. After she returned to the United States, Moore and her mother, Lucy Aukerman, designed a fabric pouch to resemble these slings but also to be rugged and to have adjustable shoulder and waist supports for the parent. Moore and Aukerman patented the Snugli in 1969. In 1978, a Nigerian child care professional named Toritse Onuwaje moved to the United States. She was dismayed at the amount of crying American babies did compared to their Nigerian counterparts. She patterned a carrier she called the Baby Wrap on the ukpoma, a cloth carrier worn by members of her native Itshekiri tribe. The women of her tribe work all day with their babies wrapped on their backs, and the babies seldom cry because the mothers' closeness is comforting. Different types of 6a6y carriers. for carrying a reclining infant. The shape was contoured to support the child's back and seat and incorporated an adjustable handle that could be raised and locked into place while the child is being carried and lowered to lift the baby in and out. Various types of fabrics cushion the child; some carriers use fabric mesh that is suspended in the frame to support the infant, while others are fitted out with padded cloth inserts that fasten in the plastic carrier securely but can be removed for cleaning. Slings and cloth carriers are manufactured from fabrics and polyester fiber or foam for stuffing or padding. The fiber is purchased in 500-lb (227-kg) bales. Velcro fasteners, woven fabric webbing for straps, and metal buckles and fasteners for supports around the parent are used to hold cloth carriers in place. Backpack-type carriers can be made mostly of cloth, but a second type consists of an aluminum frame with a cloth support for the baby and padded cloth straps that adjust to the parent. The rigid or molded infant carrier is made of polypropylene, a medium-impact plastic. It has the advantages of being lightweight, flexible, and durable. Manufacturers receive the plastic in pellets. Metal components are made of steel by specialized metal fabricators. These parts may include buckles, locking clips, and hardware for adjusting harnesses. Rivets and fabric fasteners may be made of other metals but are also supplied by specialty contractors. Fabrics used to make infant cariers include durable fabric like denim and nylon mesh and webbing for hamesses. All fabrics have to be specially treated to meet standards for flammability, but they also have to be washable. Chemical cleaning methods and even strong detergents can break down the treatments used to make the material flame-resistant, so these fabrics must be cleaned with water and mild soap. The fabrics are also chosen for their appeal, so color and fashion trends are observed by designers in selecting these materials. Foam padding and fiber fill are also required to be flame resistant. For manufacturers of molded plastic carriers, most of the cloth liners and pads are sewn by outside suppliers to the specifications of the carrier manufacturers. All infant carriers bear manufacturers' labels, and printers make paper and adhesive-backed labels according to the manufacturers' requirements and Federal standards for consumer information. There are three basic designs of infant carriers. The first is the sling of which the Snugli and Baby Wrap are best known. The second is a modification of an aluminum-framed backpack in which the pack portion is fitted to carry a baby and padded straps are provided for the parents' comfort. The third type is the molded plastic carrier that resembles an automobile safety seat with a plastic back, seat, and handle and a padded interior but without the devices needed to secure the carrier in an automobile. Factors influencing the design of infant carriers are many and relate to how the individual consumer is most comfortable carrying their child. Safety is, of course, the overriding concern. The infant must be comfortably held or restrained in the carrier, a soft carrier must have openings for the child's legs but not so large that the baby will fall out, and a rigid carrier designed to sit on solid surfaces must not tip over. Comfort for the baby is the second leading design factor. All forms of carriers have some type of cloth liner or insert to cushion the baby, and this must be comfortable as well as durable and easily cleaned. And, finally, the person carrying the child must also be comfortable. Cloth infant carriers and backpack-type carriers have to adapt to different body types so the baby can be carried with equal comfort. This is usually accomplished with a set of straps that cross the shoulders and fit around the waist or on the hips. Carriers made of molded plastic must strike the right balance between the weight and strength needed to support the child adequately and light weight for the parent to carry. These combinations of characteristics have not been easy for manufacturers to produce successfully. Consumer protection groups like the Consumer Product Safety Commission list a number of carriers that have been recalled. The molded plastic carriers have had notable problems such as failure of the handle locks that can cause the carrier to release and tip the baby out. But the cloth carriers have also been made with leg openings that are too large and allow tiny babies to slip through. To the manufacturers' defense, many more problems have been cited related to misuse of the carriers by the adults caring for the infants. Sitting a rigid carrier on a soft surface like a couch permits the baby's movements to tip the carrier over. In 1997 alone, over 8,700 children were brought to the emergency room and treated for falls from carriers. Also, a number of medical reports show that infants are left in one position in the carriers for too long. In the supine or reclining position, the back of the baby's head flattens as it rests against the carrier. Babies held upright in cloth carriers or backpack-type carriers are subject to spinal stress that complicates the natural development of curves in the spine. Sling-type carriers have been found to hold the baby in the best position for its growth. Following initial design, prototypes are sewn by hand and checked for fit on both infants and parents of a range of sizes and weights. When the final design is approved, the pattern on blueprints or computerized drawings is transferred to paper patterns. The patterns are tacked to the fabric with pins and stacked together. A fabric cutter that looks much like a band saw is used to cut through all the layers at once so the pieces for many carriers are produced at the same time. The fabric pieces are stitched together by workers operating industrial-quality sewing machines. Typically, each worker is responsible for one section of the carrier such as the back or the straps. The pieces are stitched together inside out with the seams exposed then turned right side out. Sections that will be padded are left with small openings in the seams where the padding can be added. The sections to be padded are stuffed with polyester fiber or foam padding. The fiber is purchased by the manufacturer in tightly packed bales that are fluffed up with a machine called a picker. The fiber is selected for the packing by the quality of the fibers, and, when it is inserted into the camier section as padding, it will be stuffed to the proper density. At the stuffing machine, air pressure blows the fiber into the fabric section. The operator manipulates the section to disperse the fiber throughout the section and to the desired density. The openings through which the stuffing has been added are then stitched together. The sections of the carrier are assembled to create the finished product at another set of sewing machines. Any restraining straps and webbing are stitched securely in place. Hardware and fasteners (if any) are also stitched on or driven into place by special machines, and labels are sewn in place at joins between two fabric sections. A final inspection is performed to check all the seams and fasteners, and the carrier is packed in a plastic bag and boxed. Multiple boxes are packed in shipping cartons for storage or transport. The cloth sections of the backpack-type carriers are designed, cut, stitched, and padded like the cloth carriers described above. The aluminum frames used to support the carriers are made of tubing formed by aluminum fabricators to the sizes, shapes, and curves specified by the carrier manufacturer. They are received by the carrier manufacturer in bulk lots that are distributed to bins along the assembly line. Assembly line workers pair a cloth carrier to a metal frame and attach it; methods of attachment vary widely among makers but can include Velcro and metal buckles and fasteners. Some frames also have plastic feet or pads where they balance against the parent or so they can be stood on the ground or a solid surface while the infant is placed in the carrier. These feet are inserted into holes in the frame and fastened in place. The frame/carrier assembly is inspected and packaged like the cloth carrier. Molding of the carrier's plastic shell is the first step in manufacture of this type of carrier. Plastic pellets stored in bulk are melted and injected into specially machined dies or forms for the shell. The dies are the highly detailed product of the design process, and even the finished texture of the carrier has been designed in the interior of the mold. The shells are extracted from the dies, cooled, trimmed of flashing (excess bits of plastic), and cleaned. At the assembly line, the molded shells and all other parts are distributed to work stations. Each worker is responsible for fitting the carrier with one item or type of item and handing it to the next worker who adds another piece. The padded insert that forms the cushion for the baby is a completed item that has been sewn and stuffed. It is attached to the carrier by Velcro or other fasteners. Alternatively, the nylon mesh used to make a hammock-like support for the infant in some types of carriers is attached to sections of the plastic shell that were designed to trap the mesh and lock it in place. Straps, harnesses, buckles, and labels are added in turn. In the packing department, the infant camiers are individually packed in cartons. The cartons are significant sources of information for consumers and are preprinted with consumer data as well as company information and bright designs. The cartons are stacked and bulk-wrapped in plastic for storage and distribution. Hands-on assembly is key to the construction of the three types of infant carriers described here. Workers are highly skilled in their own and related parts of manufacture of carriers, and they are rewarded for identifying errors and rejecting imperfect carriers. Molded plastic carriers are nominally the most complex to manufacture; the shell is carefully checked for uniform thickness and strength and compared to a master copy for correctness. Because manufacturers usually make several different lines or models of carriers, each product has a bill of materials listing the part numbers of all the parts making up that model. Assembly workers monitor these, and line managers periodically pull carriers from the assembly line to check the materials, review the overall quality, and test the products. The making of infant carriers results in little waste because most of the materials used can be recycled. The molded plastic shells can be reground into pellets that are mixed with new plastic pellets for melting and injection molding. The percentage of reground plastic is kept to a minimum in any single batch of new plastic. Sewn linings of the plastic shells are returned to the supplier and can often be resewn; similarly, cloth carriers can be resewn, assuming the error is not picked up and corrected immediately by the sewing machine operator. Metal parts are also recycled by suppliers. Safety concerns are important in several aspects of carrier manufacture. Sewing machines, fabric cutters, and power hand tools have automatic emergency shutoffs, safety guards, and other protections. Operation of the injection molding machinery is automated, and workers seldom have reason to approach these machines with their high operating temperatures. Mold operators wear protective gloves. Fabric cutters, sewing machine operators, and those who handle the polyester fiber and foam padding wear masks over their mouths and safety glasses. 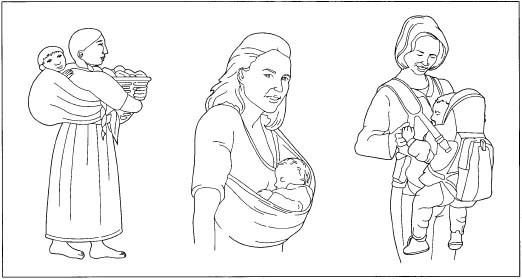 The concept of the infant carrier may be as old as civilization, yet the "modern" baby carrier is less than half a century old. Despite this new or reborn acceptance, the carrier has become an essential part of every baby's layette. This is not surprising because every parent's first priorities are the safety and comfort of that new baby. The alarming aspect of infant carriers may be the number of product recalls. Perhaps this should not be surprising either, because the manufacture of carriers is an attempt for an industry to fit a standard to tiny babies and an even wider variety of sizes and shapes of parents and care givers. Manufacturers are conscientious about doing their part to keep improving and varying products to prevent child injury and provide security. Responsibility for proper use of infant carriers is beyond the manufacturers' purview, yet they try to design out opportunities for consumer error. Doctors are also adding to the information base by studying physical changes to babies, particularly flat spots on their skulls and improper spinal development, that may be attributable to infant carriers. Recalls, errors, and skeletal stress sound like negative reasons for a product's future, but all these negatives are strong motivators toward the best possible products for the most babies. Bernhard, Emery. A Ride on Mother's Back: A Day of Baby Carrying Around the World. New York: Gulliver Books, Harcourt Brace & Company, 1996. Karvonen, Karen. "Child Carriers." Women's Sports and Fitness 14, no. 5 (July-August 1992): 112. Quindlen, Anna. "A Mother's Nominees For the Nobel Prize." New York Times (September 21, 1986). Sommars, Jack. "Oh Baby!" Colorado Business Magazine 23, no. 3 (March 1996): 16. Consumer Product Safety Commission. http://www.cpsc.gov (September 18, 2000). "43 Reasons to Carry Your Baby." Nuturing Magazine (1998). http://www.nurturing.ca/carrybaby.htm (January 2001). The Lemelson-MIT Prize Program: Women's History Month. http://web.mit.edu/invent/www/inventorsR-Z/whm3.html (September 27, 2000). Loving Attachment. Choosing a Carrier: Infant Carriers and Spinal Stress. http://www.lovingattachment.com (September 27, 2000). The Mayo Clinic. Misshapen Infant Heads: Not an Epidemic (May 22, 1999). http://www.mayohealth.org/home?id=CC0OO10 (September 27, 2000).